For for the NES game, see Mega Man 5. Mega Man V, known as Rockman World 5 (ロックマンワールド5, Rokkuman Wārudo Faibu?) in Japan, is a platformer developed by Minakuchi Engineering and published by Capcom for the Game Boy in 1994. It is the fifth and final game in the Game Boy version of the original Mega Man series. In 2013, Mega Man V was made available on the 3DS Virtual Console of Japan's Nintendo eShop for the Nintendo 3DS. It was later released in the North American eShop in 2014. Mega Man V is an action platformer in which the player selects stages in a non-linear fashion and acquires the weapon of each boss defeated to use as their own. Although it plays nearly identical to any other games in the series, Mega Man V features a new default weapon (the powerful "Mega Arm") and introduces Tango, a new assistant character. The game follows the adventures of the protagonist Mega Man as he must defend the Earth from a group of powerful robots from outer space called the "Stardroids". 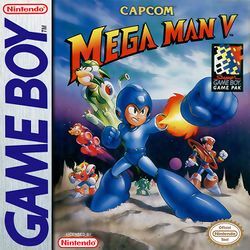 Mega Man V was also unique from the previous Game Boy Mega Man games as it features original and unique bosses rather than recycling those from the original NES Mega Man games. The game opens in an unspecified year in the 21st century ("20XX AD"), several months after the events of Mega Man IV and another failure by the infamous Dr. Wily to conquer the world. Mega Man and his sister Roll are strolling through a grassy field, when suddenly, they are confronted by a mysterious new robot who calls himself Terra. Mega Man attempts to fight Terra, only to find that his "Mega Buster" arm cannon has no effect on this new powerful enemy. Mega Man is knocked unconscious, and two groups of powerful robots calling themselves the "Stardroids" attack Earth, defeating numerous robots, including Robot Masters from previous Mega Man games. Waking up in Dr. Light's laboratory, Mega Man is presented with the new and powerful "Mega Arm" to help him fight the Stardroids in his newest mission to save the planet. ↑ Rockman & Forte: Challenger from the Future is not the sequel. ↑ Dr. Light: Mega Man, our world is once again in chaos. The alien robots call themselves "Stardroids" and have conquered most our major cities. They are constructed of alien material which renders our weapons useless. But I have done some analysis and constructed a new weapon for you. It will replace your Super Mega Buster. It is called the "Mega Arm" and it allows you to charge energy in your fist before you fire it. This page was last edited on 23 November 2015, at 17:20.